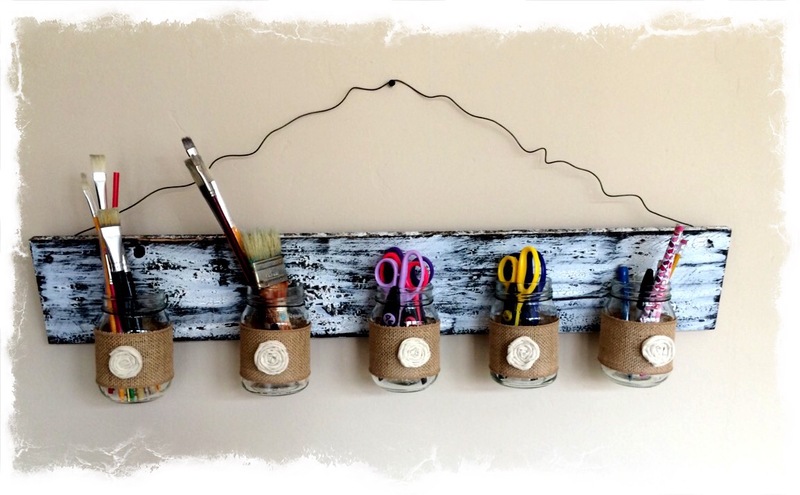 This diy rustic Mason jar storage rack would be great for a craft room, the bathroom, or even the kitchen to store utensils. Easy to make, and you can leave the Mason jars plain or decorate them however you choose. For this Mason jar storage rack I wrapped burlap around the jars, then embellished it with a handmade fabric flower. First I cut a piece of cedar fence picket measuring 3 foot in length. Then I gave it a quick sanding, and stain it with a dark water base stain. 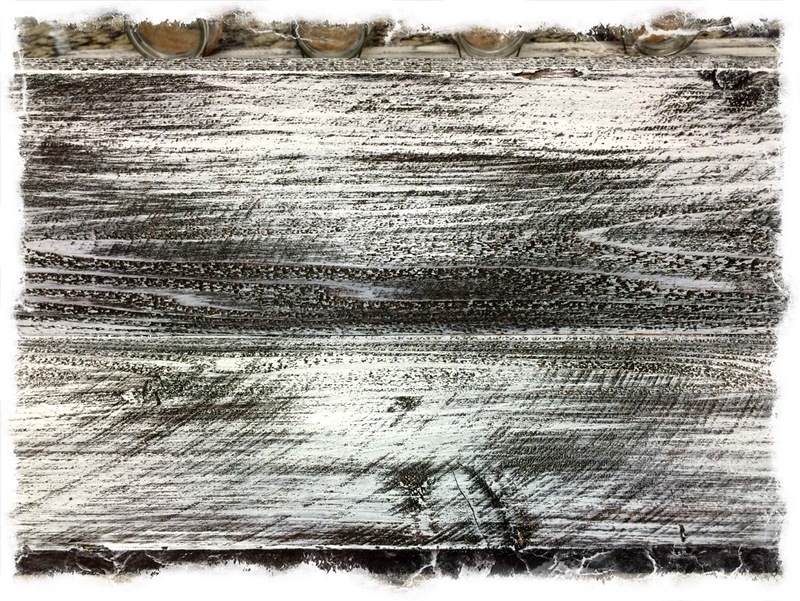 I then dry brushed some white acrylic paint over the stain not covering it completely. If you will be using sawtooth hooks for hanging go ahead and attach them now as well. If you want to use wire like I did then drill a hole at the top of each end. Decide where you want to connect each of your Mason jars, then drill two holes about 1 1/2″ apart for each jar. Take about a 6-7″ length of wire and holding the jar in place with the wire around the neck of the jar run the ends of the wire through the two holes. From the back using pliers twist the wire tight until the jar is snug to the wood. Continue until you have all your jars in place. If hanging by wire instead of sawtooth hook then go ahead and connect your wire and that’s it. 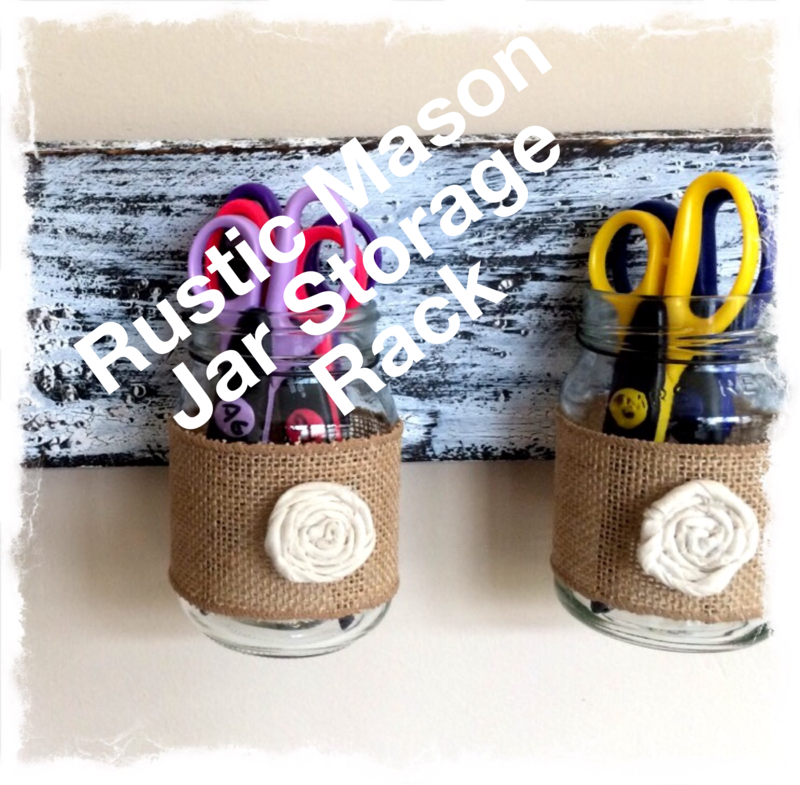 Your ready to hang your rustic Mason jar storage rack and start getting things organized. 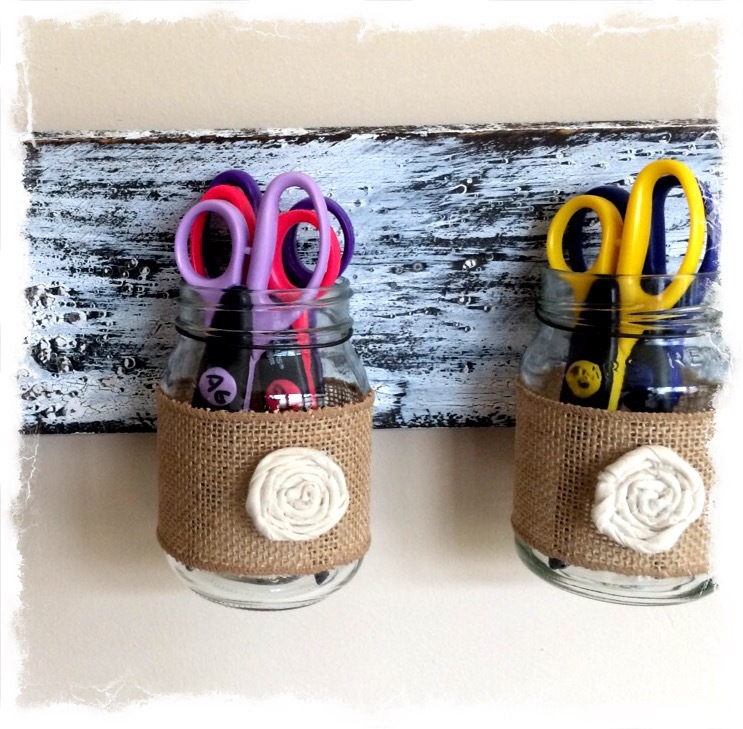 Have you done any Mason jar crafts lately? I love this idea! I haven’t done anything with mason jars lately. But I wouldn’t mind doing so. Hi Nikki! I love repurposing jars, there’s so many neat projects you can make with jars. Thanks for stopping by! Great idea! I have old Mason jars that would be great with this idea. I think I even have the wood on hand to make it! Robin Follette recently posted…Robin’s Outdoors Newsletter! Thanks Robin! Makes great storage for the craft room. I love repurposing mason jars and can into cute storage containers. Thanks for stopping by! I bought something like this last year but I have yet to hang it up…. Hi Ashley! You should hang it up. If you have a craft room, or even in the bathroom or kitchen it would be great to help organize things. Thanks for stopping by! OMG, this is such a cute idea! I would well for the kitchen to 🙂 Great post! Thank you Kristie! Yes this would come in handy in the kitchen, so many ways to use it. Thanks for stopping by! Hi Sue! Yes you can make these for next to nothing. And it’s so much more fun giving something that you’ve made. Thanks for stopping by! This is super adorable! I have about 10 mason jars left over from a party I hosted and have been looking for something to do with them. Thank you Sara! They do make great organizer. Thanks for stopping by! So cute! I love all things burlap. Thank you Chastity! I’m a little crazy for burlap crafts myself. Thanks for stopping by! Very cute idea! I should incorporate this into my new craft room to help store my millions of supplies! Hi Aliza! 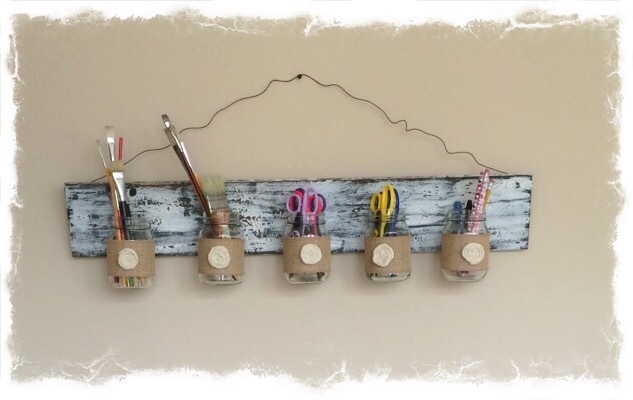 It would be great for organizing a craft room and easy to make. Thanks for stopping by! Hi Charlene! Thanks you, and thanks for stopping by. Your hot pockets look delicious, pinned to try later. I love this!! I love anything that has to do with mason jars. Perfect for storing the kids art. Thanks for sharing. Great idea. Thanks Christina! This would be perfect for storing craft supplies! Cute idea, Linda!! I love the burlap and little lace flowers!! Thank you Heather! I think the jars needed a little extra. Thank you Carol! I really love rustic crafts too! Thanks for stopping by! Thank you Renee! I love rustic, and mason jar crafts. This is totally adorable. I can see it in a bathroom with all the necessities. You make such cute things! Thank you Terri! It would be great for the bathroom. Thanks for stopping by! Thank you Maria! Those were fun fabric strip flowers that I made and glued on the burlap.